1 Chronicles 11:13 He was with David at Pasdammim, and there the Philistines were gathered together to battle, where there was a plot of ground full of barley; and the people fled from before the Philistines. 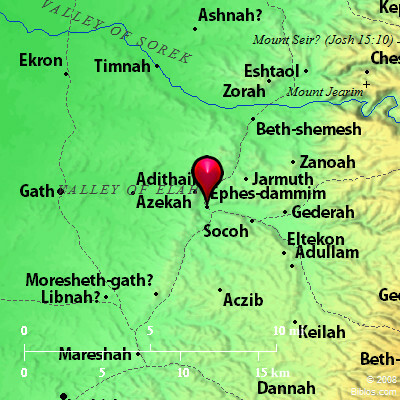 PAS-DAM'MIM, also Ephes-dammim, it was in the valley of Elah, now Damum, 13 1/2 ms. w.s.w. from Jerusalem. Conder has omitted this place on his Atlas maps entirely. It is on Smith & Grove's Atlas as above and Van de Velde thought he identified it, but it is doubtful.